I can't believe it took me so long to finally book a trip to Cambodia. You know how it is: sometimes, when you dream about a destination for such a long time, you're afraid it won't meet your expectations, so you'd rather just keep dreaming about it. But when I heard about the Angkor Empire Half Marathon, I couldn't resist. It was time for me to see Cambodia. My trip in Cambodia appeared to be one of the most fantastic discoveries I've had the chance to make in Southeast Asia. There are many reasons to love Cambodia -the atmosphere is very chilled out, the scenery astonishing, the food delicious and the history of the country fascinating. Planning a trip in Cambodia can be a hassle, as there is so much to see in such a little time. Now let me share with you my 4 days itinerary in Cambodia -what to see in Angkor and Siem Reap, besides the obvious. I was short on time, but you should know you could easily plan a one week trip in Cambodia, exploring temples, the city and surroundings and still be busy everyday. There's a lot to see around! Temple hopping in Angkor can be exhausting between the tuk-tuk rides and the heat, so I'd recommend to book a nice place to stay: you will DREAM about some tranquility at the end of the day -I stayed in Maison 557 and LOVED it, it's a charming intimate garden retreat a short walk from the city center. I figured it would be easier to get on a long tuk tuk journey on my first day than at the end of the trip, so I decided to start my exploration by heading to Banteay Srei, a beautiful Hindu temple hidden far from Angkor's crowd -32km northeast of Siem Reap and 21km northeast of Bayon. Cut from a pinkish stone, the carving is fine and beautiful. The site is very small and that's what makes its charm: it's calm, there aren't many tourists around, and it's wonderfully well preserved. After this lovely discovery, my tuk tuk takes me to Preah Khan, one of the largest complexes in Angkor, but not the most popular. So I carry on my exploration in one of Angkor's (almost) deserted temples. Preah Khan features some long vaulted corridors that stage stunning light games. Given that it's largely unrestored and so tranquil, I enjoy every moment wandering in this temple. This first day exploring Angkor Temples finishes perfectly with a tiny temple lost in the jungle named Ta Nei. Coming to Cambodia, I was hopping for some adventure, but didn't think I would have the chance to have a temple for myself! >> Read all about it in my post Beyond Angkor's Classics : Lost in a temple. After these beautiful discoveries, I get back to Maison 557 for a relaxing swim in my private pool. Then it's time to explore Siem Reap : live music, delicious fresh spring rolls, foot massages, art & craft stores... This city is full of surprises! The day is just getting started and I'm already in the middle of an Indiana Jones fantasy! Ta Prohm is the temple that will make you feel like you went back in time and just arrived in the middle of an old adventure movie. The atmosphere exceeds all expectations -it's so beautiful, it's hard to believe it's real. The walls and towers are locked in a messy root system. The trees themselves are so majestic and twisted they look like sculptures. This temple has literally been swallowed by nature. I'll spend the whole morning wandering around giant trees, walls and corridors, amazed by this unique beauty. My exploration of the surrounding temples goes on with Thommanon, Baphuon, Phimeanakas, Wat Preah Ngok and the Terrace of the Elephants. On my way, I cross some cute baby monkeys playing around -so cute it's hard to leave them. But it's time to head back home for a bowl of noodles, then off to bed. Tomorrow is a big day! 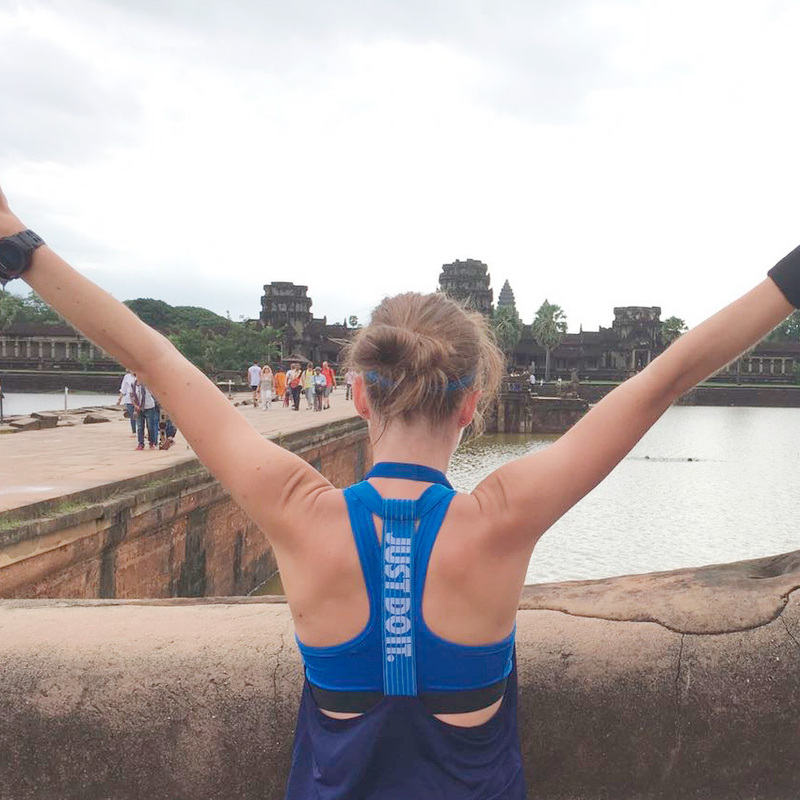 I could go on and on about that day I ran with the Gods : the Angkor Empire Half Marathon was from far the most incredible races I've had the chance to run. Even a year later, just talking about it gives me chills. Imagine running 21k across Angkor Temples and lush nature, cheered by local kids in their cute school uniforms. I was floating on clouds. After that adventure, a well deserved breakfast awaits me in Maison 557. Alida has prepared me plenty of fresh fruits with yogurt, breads, juice and tea -exactly what I need to recover! After this scrumptious meal, a swim in the pool, and a nap under the palm trees shade, I decide to take it easy and explore Siem Reap deeper. I discover the Artisans d'Angkor ateliers, some lovely cafes and shops, and end up having an amazing foot massage while people watching. Before the sun sets, I hop on a tuk tuk to Bayon Temple, one of THE must-see temples in Angkor. This mountain temple is known for its hundreds of smiling faces all around. As I expected, it's not the most charming -there are waaay too many selfie sticks around for that. Beside the crowd, the complex itself is an incredible piece of art. I must say, it's not easy to wake up at 5am the day after running a half marathon, but I somehow manage to get to Angkor Wat before sunrise. Of course, it's crowded, but nothing like what I feared -ah, the advantage of traveling off season! I get why it's THE temple to see : it's massive -one of the largest religious monuments in the world. The whole complex measures more than 162 hectares. Obviously, the temple is big enough to find some quiet parts and enjoy the visit. After this gorgeous visit, I head back to Maison 557 for one last delicious breakfast by the pool, then jump on a tuk tuk to discover some more Cambodian gems. I enjoy getting lost in Banteay Kdei, drinking a fresh coconut on the shores of Srah Srang, then finish in Neak Pean, a beautiful water temple. The journey to get there is scenic, with every-changing landscapes, from dirt path to swamps inhabited by massive water buffalos. Neak Pean is a Buddhist temple situated on a circular island surrounded by water. There's not much to visit, but the atmosphere's got something unique, hidden in the nature. I finish my trip in Cambodia in beauty with a dinner in the lovely Chanrey Tree restaurant by the river, fresh fruit juices in Siem Reap night market with live music in the background. That's only a tiny part of Cambodia I saw, but it was a fabulous preview of what the country has to offer! Respect the temple's sanctity : wear long pants and avoid tank tops. It's hot, don't forget to take a hat, sunblock, lots of water and a raincoat during wet season. Travel slow: be in peace with the fact that you won't see everything, take the time to enjoy every moment, have a nap under a tree, a picnic by the water... Angkor temples isn't something you rush. Don't forget Siem Reap: this city is worth a visit! Avoid the tourists restaurants, ask your driver to take you to local places -they're better and cheaper. Plan ahead with the names of the temples you want to see and a map. I've got friends who wanted to see Ta Nei, their tuk tuk driver didn't know the place so they haven't had the chance to see it. That's a shame, when you know how incredible this temple is. best season to explore angkor? There is no BEST season. There's a dry season, a (very) hot one, and a monsoon season. What you call "the best" really depends on your priorities. Traveling in August during the wet season was perfect for me, even if I had to avoid a few showers: it's much less crowded than in peak season, and at least I could breath, it wasn't too hot! You can choose a pass for the temples depending on how many days you are planning to explore Angkor. Some remote temples might charge you on top of the pass. Cambodia was fabulous, but one negative point was the budget : they charge you in US$, so prices aren't as cheap in Cambodia than in the rest of Southeast Asia. That's the price you pay for magic and tranquility!